It’s that time again… Tim Horton’s Roll-up the Rim to Win contest is in full swing. And as usual, I’m losing. The official count thus far for this year’s efforts is 0/7. I wrote last year about how I never win unless something catastrophic happens. And I don’t remember (and didn’t post) whether or not I won anything in 2005 – so I can’t disprove my theory yet. In the meantime, I’m highly caffeinated and gunning for a doughnut. *whine* why oh why did you have to tell me this? i have worked so hard to put timmys from my mind. now i shall be dreaming of a large 1 & 1 and a sour cream glazed donut. pure heaven. good luck rollin’! 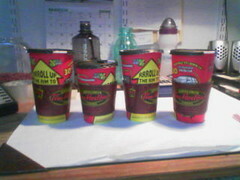 I work at a Tim Hortons and its been pretty crazy with people trying to steal the paper cups o_O! SAFFE: When I went in yesterday morning, my local Tim’s was receiving a delivery, and had boxes upon boxes of cups sitting outside next to the building. The idea of trying to escape with one did cross my mind! Now, please don’t take this the wrong way, because normally I am bitching about the same thing as you, since I go to Timmay’s EVERY SINGLE DAY before work…. …but yesterday’s coffee rounded up a Broil King Barbecue. and last week I won 2 coffees. This NEVER happens to me, I swear. I guess they don’t put prize cups in this side of the country either because I never win anything over here in New Brunswick. Someone should tell the East coast about those sleeves, we have to get double cupped over here, what a waste. I heard on the news this morning that a 10 year old back east found a Timmy’s cup in the garbage and she couldn’t unroll the rim so she asked an older girl to help her. When they unrolled it they discovered that it held the grand prize of an SUV! Now the parents of the girl that helped unroll it are suing the young girls family who found it for an equal share of the proceeds from the sale of the SUV. The 1st family was originally going to share anyway – but now that they’ve gone to this level and suing them, they said forget it! So now it’s going to the courts! Sheesh! What next?? It’ s funny how marketing works you know. Today I really didn’t want a coffee and I totally could’ve saved the $1.25 or whatever, but we spoke of the “suv win” at work today as well and then I had coffee on my mind. Was it really the coffee that was on my mind or the “chance of winning…” DAMMIT – I hate it when I fall for the traps. Indidently Jen, I didn’t win either and that makes me 0/1. Tim Cup, dont be a thief or feel bad. Buy one on eBay, Too Funny!